Distributed practice is more effective than massed practice. That's a fancy way of saying that practicing your violin for a period of time every day is more important than practicing for a long time at once. In other words, practice for 30 minutes every day, not 210 minutes once a week! 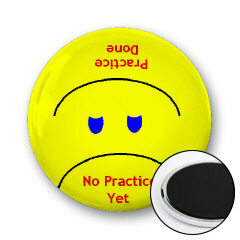 What happens if you miss a practice every once in a while? Don't worry! Just pick up where you left off. Miss a bunch of practices in a row? That is more of a problem. You might consider going back a week and starting back to work on something that you play really solidly. Then you can work your way back into the groove and get back to where you were before your little "vacation." 3-minute practice will probably not help you very much. You need to practice long enough that you really can get some good practice in. And if you have to cut a practice short, make sure that the time you spend practicing is really quality time. Remember, daily practice is important. A Suzuki teacher I know advises students to only practice on the days that they eat. Start the Day With the Sad Face Showing. When The Student Has Completed Practice Allow Him to Twist the Magnet (Place Your Mouse Over the Picture) to Turn That Frown into a Smile. Practice Done! The Ultimate Collection Of Violin Methods And Studies For violin. Printable and viewable for PC and Macintosh. Format: CD Sheet Music. Studies, Technique, Classical Period and Romantic Period. 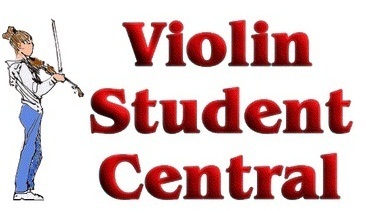 The ultimate collection of violin methods and studies. 2000 printable pages. 5.5x5 inches. Published by Theodore Presser Co.
usually beats one 180-minute practice!